Plenty to catch up on. It has been quite sometime since we paid a visit to Sheffield, in fact we’ve not visited since the end of November! Weekly phone calls have been taking place but all of them much the same regarding the Lithium batteries, or lack of one of them! 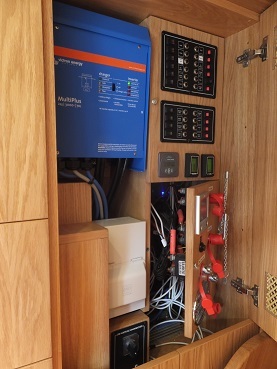 Without the full complement of batteries it has not been worth Finesse putting NB Oleanna in the water as they wouldn’t be able to adjust the ballast or test the remaining systems without the extra battery. 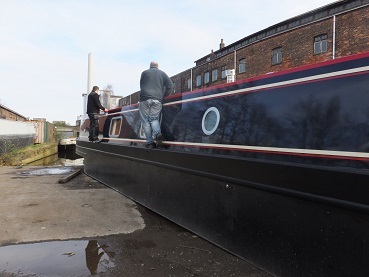 But with several boats being moved next week by crane she will be getting her bottom wet, battery or not. We decided that a visit was worth doing as quite a lot has been done over the last few months and climbing on board next week we would only get in the way. Chris and Ricky were on hand to show us round and answer questions. 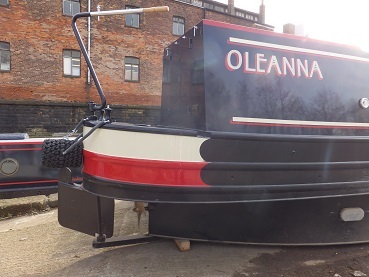 A couple of weeks ago NB Oleanna was moved out of the fitout shop and into the yard, she was taking up much needed space and with a full compliment of mushroom vents fitted she was water tight. She has had a bit of a clean up, but not the full works yet, as sitting in the yard she is bound to get dirty. There are also bits of tape left from masking on the hull. Since our last visit the lower red and cream lines have been repainted, swapped over on the cabin sides to match the original design. The lines have had to be slightly thickened but the shadow of the previous paint is very faint. It may be a small thing to some but to me she looks better with all her red shadows in the right places. 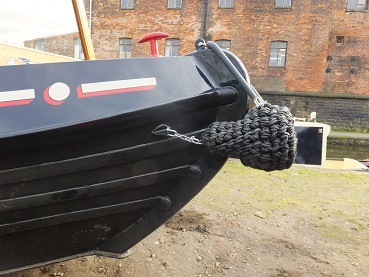 The gunnels have had their top coats of satin black from the cratch board back to the feathers on the stern. This is the area that no matter how hard you try not to, it will always get marked in locks. 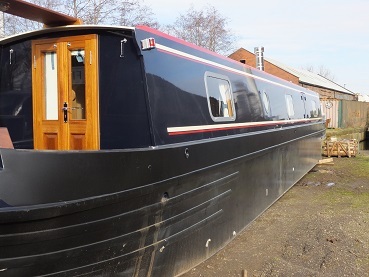 So I chose the same paint that we have on our current boat NB Lillyanne as it is easy to touch up (when you get round to it!). The rubbing strake between the red and cream on the tunnel band is still to be painted black. 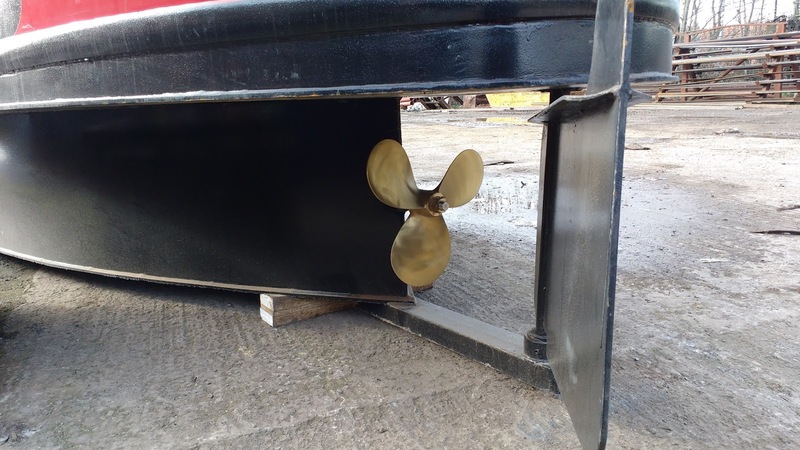 The bow and stern fenders have been fitted, chains hold them in position. 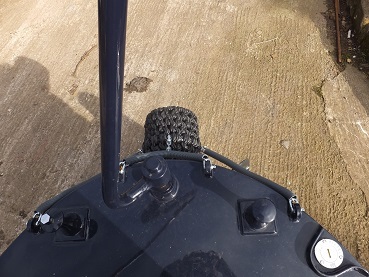 On lengths where the chain may rub the paintwork plastic tubing has been added over the chain for protection. 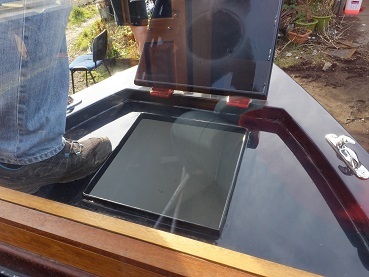 The stern counter, not in any photos has also had a coat of the gunnel black as this area will also get a lot of wear. Below the gunnel there is one chrome surround on the shower outlet. We are not sure whether the other outlets will be getting these or that it has one because there is a pump on the other side. On the other cabin side the outlets for the urine tank have been labelled. 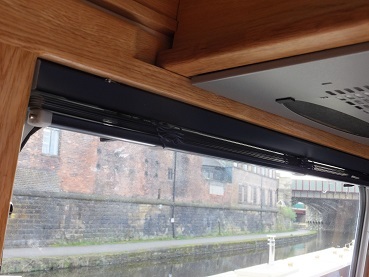 The internet aerial has been fitted onto the back of the cabin, this will fit under the pram cover when it is fitted. 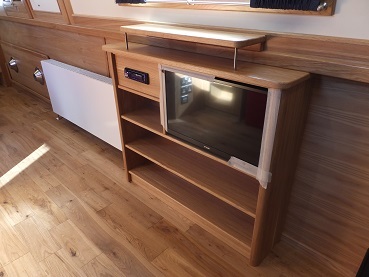 The other box on the back of the cabin is for the TV aerial. 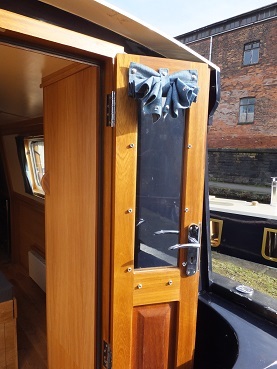 The Iroko locker lids are in position and a top has been put on the morse control. So should we want to we can sit there without getting a chilly bum. 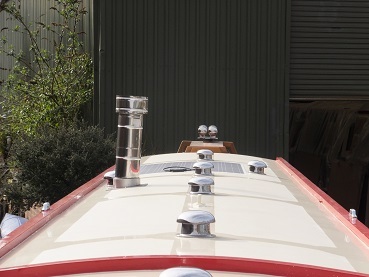 The roof is looking cream and shiny with the neatly positioned mushroom vents and her tall chrome chimney. There was only enough room for the size of solar panel we wanted above the bathroom. It’s position here does mean that it is unlikely to get walked on much or have the centre line left on top of it, so hopefully it will stay cleaner longer and therefore be more efficient. There is the ability to be able to add a second panel when we can afford one. 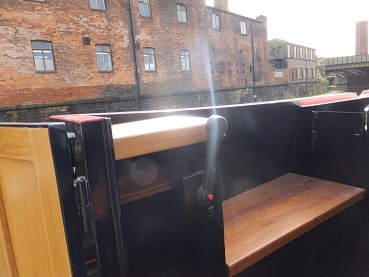 At both the bow and stern we have a hook up point. 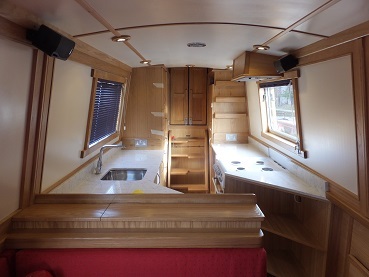 Our current boat has one either end and we like the freedom of being able to moor either way round in marinas. 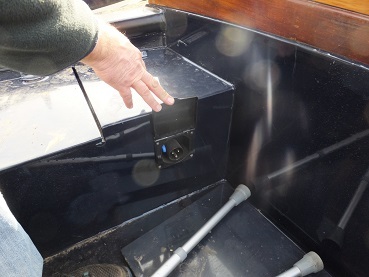 The locker lid on the floor is for the bow thruster. The gas locker is all nice and clean, no canal water in there as yet! We will have to find ourselves two gas bottles and for the first time pay the deposit on them. To the right of the picture you can see a fairlead on the bow. 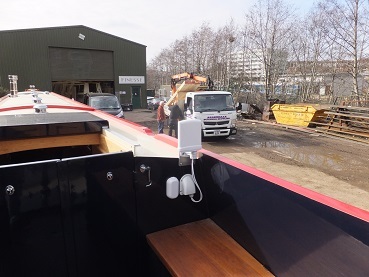 This is so that we can direct our ropes when mooring and not damage the paintwork, hopefully. Sitting on the front of the cratch board all proud and slightly frog like are the horn and tunnel light. The cables for these go through the cratch board. 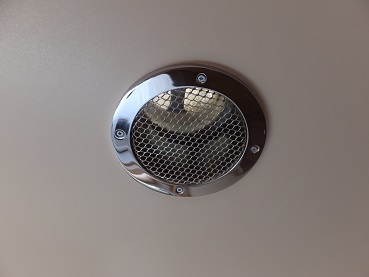 The two plugs hanging down are so that should we want to remove the light or horn then we can cap off the power. 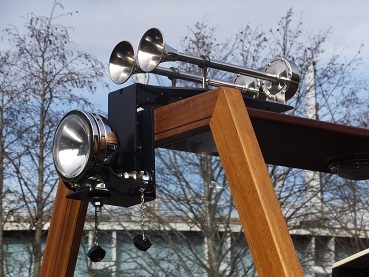 We didn’t expect a two trumpet tooting horn, it certainly looks like it means business. We haven’t tried it out yet. On the front doors the coverings were in place. Here we couldn’t have a conventional blind as there wasn’t enough space above the doors to house one and the door handle sits too proud. I’m not a great fan of bungs as we’d need somewhere to store them and curtains would cut out too much of the light. So Kim suggested having panels that popper onto the doors and roll up when not in use. The closed effect is great neat and simple. I may have a little tinker with them to see how best to roll them up though. The memory foam mattress has arrived. 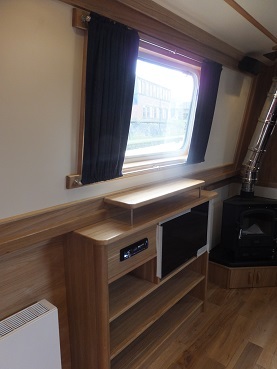 The infill section sits nicely in line with the bedside cupboards when the bed is folded away. 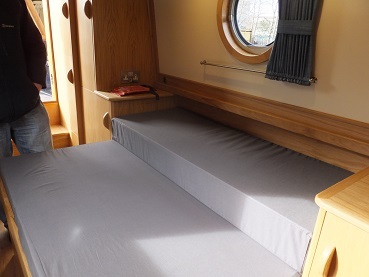 The bed extends by pulling out the end and resting it on a ledge on the cabin side, the infill section will then slot into the gap. I suspect the infill will end up just being folded ontop of the rest of the bed so that it is easier to make it up at the end of a day. 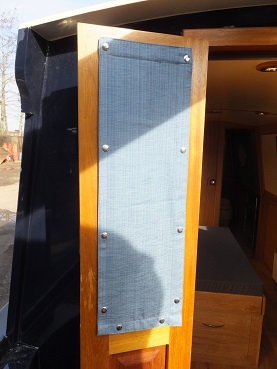 The linen blue curtains are up and have small ties on them. These are very neat sitting on their brushed poles. Ever since the floors were laid they have been covered in protective cardboard whilst work was on going. Today is the first time we’d seen the bathroom floor. It sits well with the blue and wood. The urine tank pump has been tested with water, we will need a section of hose and a bottle to pump out into. The bucket however has not been tried or tested , that will be left for us. 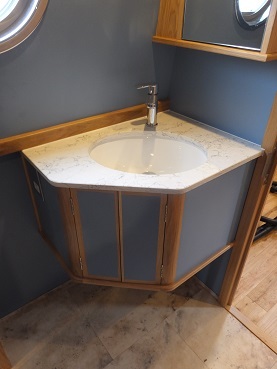 The sink top has been mounted with a longer reaching tap than I’d originally specced as the rim of the sink was too thick for it. 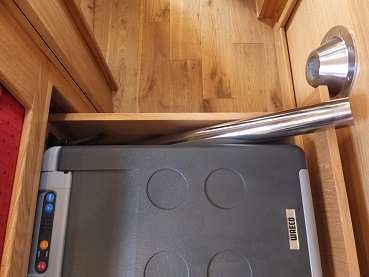 On the side of the under sink cupboard on the left is a shaver socket. 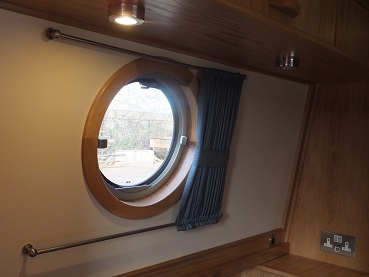 Kim has made us cream bungs for the portholes in here. For much of the year I suspect we won’t bother with them, but they will certainly be used on those bright sunny spring mornings when light floods in and works its way into your sleepy eyes. 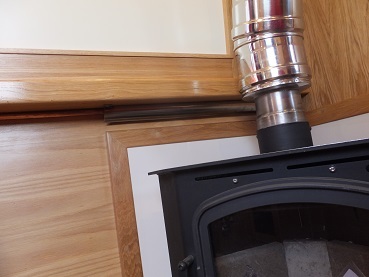 The gas pipe that sits under the gunnel behind the stove has had some fireboard put in front of it along with some stainless steel to protect it from the heat. 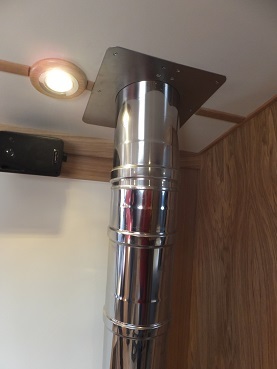 The top of the flue has been trimmed off with stainless steel. We now have a TV. The one that we had specced has been superseded by one that was 5mm bigger! This meant that the housing for the radio had to be reduced in width for the TV to fit. The PVR is still to go in, we just hope that the space for it is still an okay size. The Houdini shelf is in which I know Tilly our cat will appreciate when she moves on board, just so long as her tail doesn’t get in the way! From here on in there may be quite a lot of masking tape in the photos, this was used to help keep cupboards and drawers closed when they were moving her out from the workshop. The wooden floor is now visible and needs a final sweep and clean. 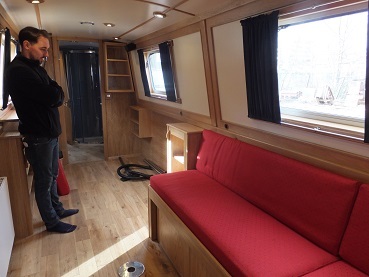 The curtains are fitted in the main cabin. To be able to wash them I’ll have to undo the end brackets on the rails, but that should be easy enough. The space for the sofa is ready, that will be delivered next Monday from Sofabed Barn. 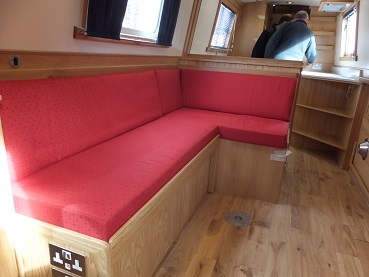 The dinette cushions were in position. The red shows up as being paler in the photos. One extra cushion is needed to make this up into a bed which can live at other times behind the long side of the back. To make the bed you lift the front edge on the long side and pull the seat towards you. The cushions then lower flat onto the base and adding the extra cushion in behind them fills the gap. The dinette table was in it’s storage position, but nowhere had been found to store the legs other than under the seating. The gap at the side of the freezer came to mind. They fit in width ways quite well, but the drawer was too short. Ricky is going to see if they can add a short extension to the end of the drawer so that the legs can be stored there. I’ll put a bit of felt in between them to stop them making any noise. 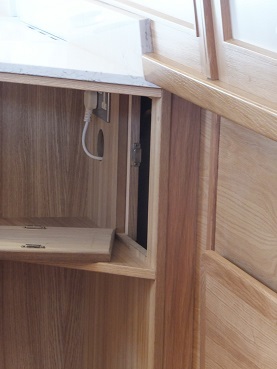 The drawer extending further into the dinette won’t be a problem as that section will be for things that we rarely use. 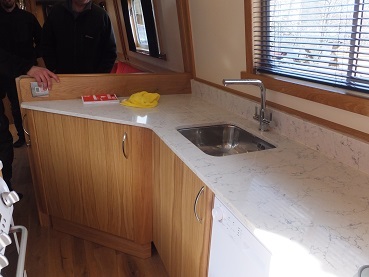 The galley worktops and splash backs are in along with the sink and taps. The worktop looks better in the flesh and I’m glad we eventually found something with a vein to it. 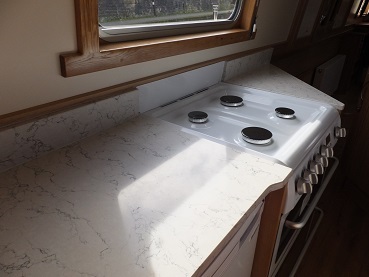 Grooves have been put in the worktop into the corner from the sink to act as a drainer. 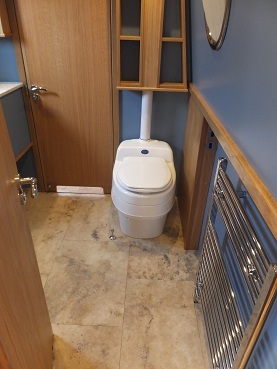 Apparently my choice of tap has been popular, other owners have asked for the same one as it nicely mirrors the angle of the cabin. 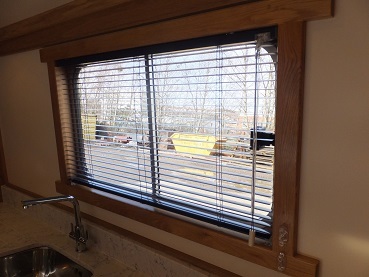 The blinds have been fitted and look great. They have hold downs in the bottom corners that keep them in line with the cabin sides. 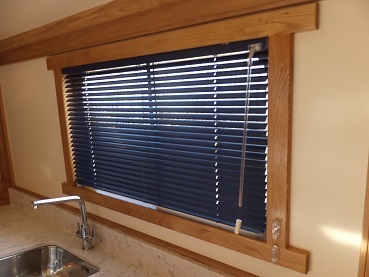 A twist of the wand and you can open and close the slats. Or you can pull them up out of the way totally. The wand and cord loop can be held out of the way with the fixings on the bottom right. Here’s hoping they are cat proof! 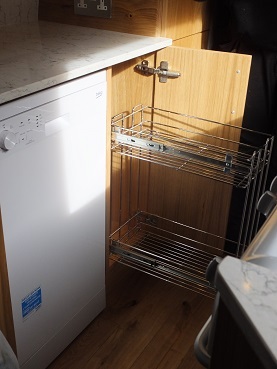 A pull out larder unit has been added into the 300mm wide cupboard next to the dishwasher. Depending on what food items go in here I might see if I can get another basket to fit it giving us three shelves. Under the corner worktop by the cooker there is a panel that opens to access the gas isolation valve. 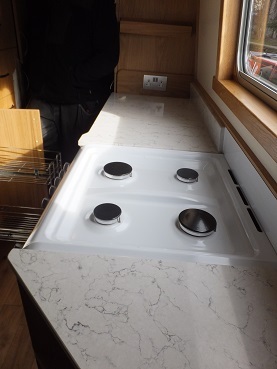 As the cooker had to be positioned slightly forward of the other units the worktop has been shaped to accommodate this. 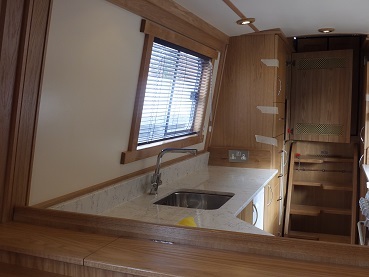 Behind the cooker there is a gap in the splash back and a section of white stainless steel has been added to help deflect heat away from the cabin side from the hob and oven. The pan supports are still to be put on the cooker. The electrics cupboard is finished neat and tidy. 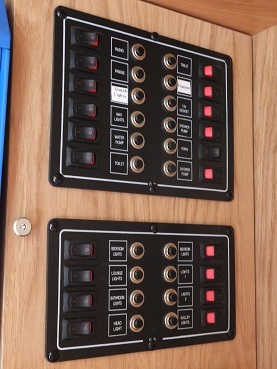 The switches panel is all labelled up and it’s position inside this cupboard means that you can’t accidently knock anything off as you get in and out of the boat. The water tank was partially full, but no diesel was registering on the gauge. We don’t think she’ll come with a full tank! A short list of jobs to be done was made. A surveyor did a BSC last week, everything passed but he requires us to have larger fire extinguishers due to our boiler being inside the cabin and not the engine bay. Positions for these were discussed along with the fire blanket. Covers are still outstanding. When she was going to be launched in Macclesfield we were going to use All Seasons Covers as they were local. Now that we have reverted to the original plan of launching at Crick we are in other companies areas. But they all have waiting lists, some of months. So as soon as we decide which way we will be pointing her bow from Crick we shall book her in. We’ll most probably have most of the summer without covers, as long as they are with us by the autumn that will be okay. The main missing factor is still the lithium battery. Several solutions were discussed with Ricky and we are all still hoping that the company will send the right battery before we are at the yard again next week. If not, we will have to chose which way to go with the power so that the remaining tests can be carried out and we can have our new boat. Ending on a lighter note here is the galley again. This entry was posted in Uncategorized on 10th Mar 2017 by pipandmick. She looks lovely. Can't wait to read about your cruising! Thanks Tom and Jan. We can't wait to write about it!